Our clients opinions were always very important for us. 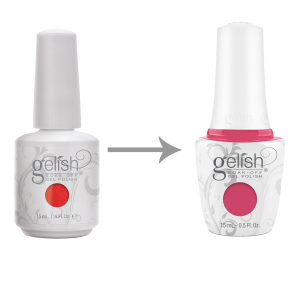 This is why we created another revolution – new bottle of Gelish! First what you will notice is totally new bottle – It corresponds to the Morgan Taylor bottle – which is another of our steps to run both lines with one track. Now Gelish and Morgan Taylor are officialy married! The bottle does not have a window, so it is even better protected from curing, and the color is visible on the side and from the top also it perfectly reflects its content. What’s next? In the bottle you will find a new, rounded brush that will make it easier to paint near the cuticle area. That’s not all … The most interesting change you will not see at first glance. Gelish in new bottle have a NEW FORMULA that will impress stylists and get them to work with Gelish if they have not already done so.